I haven't knitted anything in ages, and that's too bad. I'd really like to get into it again, but I'm not sure what I could knit that I could wear here. Hats and scarves are out, as are gloves and mittens. I might have to break down and attempt socks. I'll also need to see what the options are for really lightweight, cheesecloth-y cotton yarn. This is the project I've been working on for...what is it, over a year now? 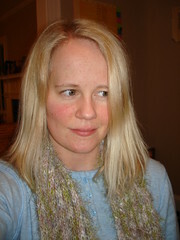 With last fall's job search and the dissertation, I went months at a time without knitting. But the last week or so, I've been picking it back up, and now the purse is almost ready; all I have to do now is sew the pieces together and felt it. I know it's nothing much, but one thing I'm somewhat proud of is that it's my most ambitious felting project to date, the others being mere potholders. Also, this yarn didn't cost me a dime; I got it from Freecycle. In my composition courses this semester (two FYC and one Advanced Composition), the first assignment is a list-style composition after the style of Being Poor, preferably engaging the local setting -- life in Greenville or North Carolina. The first-year students are doing this as a collaborative assignment. As I've said before, I think there's really something to the list as form that makes it especially participatory. Notice how many people built on the White Privilege Checklist (links) and the 350+ comments at the "Being Poor" post, many of which contribute to the list. There was also a separate response to "Being Poor" which I'm assigning along with several other list compositions. The idea is that in the first-year classes, students have to get to know each other enough to find some common ground, so that each one can contribute points to the list. Hopefully it'll go well. My fear of flying has been renewed. I had an awful dream last night. My left arm had been torn off at the shoulder somehow, and I was holding it with my other arm. It was heavy, and I couldn't lift it high enough and hold it steady enough to set the bone. I thought, "I'm going to have to find a doctor to do this, and it's going to hurt." 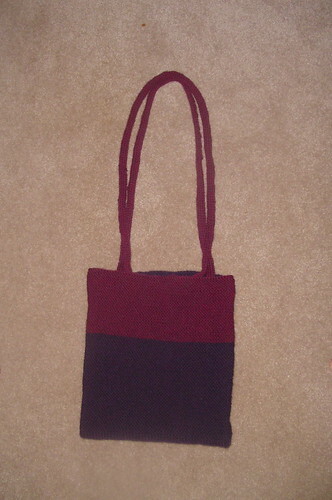 I'm close to finishing the knitting project I've been working on for SUCH a LONG time and getting sidetracked from: a felted handbag. I'll post pictures if it looks okay. Cool! 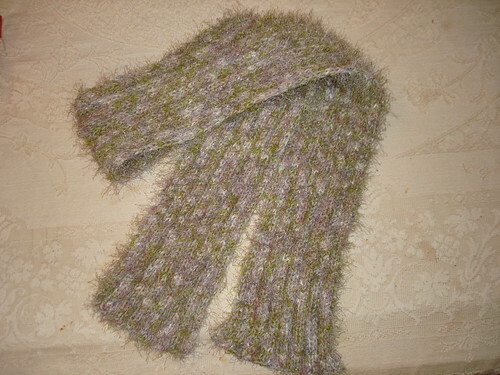 Someone has put photos of my knitting on Wikimedia Commons. On another knitting note, I taught Tiana, daughter of Rachel, to knit last night! I hope I did an okay job. In the latest issue of Genders, there's an analysis of "Extreme Makeover": Beauty, Desire, and Anxiety: The Economy of Sameness in ABC's Extreme Makeover. Interesting stuff, well worth the read. There's a special aggregation of bloggers who are posting about iLaw 2005. Not all the posts are about iLaw, but at least it's an attempt to put all the weblogs that might have iLaw notes in one place. Of course, in a perfect world, they'd all use Drupal and create an iLaw 2005 category, and then we could have category-specific feeds. :-) Nevertheless, I'll be reading. I wish I could be there; it looks fascinating. But if I were at iLaw, I wouldn't get to go to the memorial for Allison Crews this evening. By the way, it now appears as though the cause of death is uncertain, but who knows if "a friend" is a reliable source. I guess we'll know more later. I'm in Alabama until Saturday, and while I've been working at the library here, I've also been watching too much vapid TV and too many movies (we're talking stuff like Bubble Boy, Eulogy, and Wet Hot American Summer). So I have to hit the books, course preparation, dissertation, everything when I get back. But for now, a fluff post with no interparagraphic transitions whatsoever. Proposals are being sought for a special issue of Technical Communication Quarterly on Technical Communication in the Age of Distributed Work. It's going to be great once it comes out, very forward-thinking. Note to self: I want to use the famous Margaret Mead quotation: "Never doubt that a small group of thoughtful, committed citizens can change the world. Indeed, it is the only thing that ever has" in my syllabus for the class I'm teaching this summer. [Edited to add: Does anyone know what the original source for that is? I hate not having a specific page number or date/place, if it's a speech.] It's called "Group Process, Team Building, and Leadership," and it centers on work done in small groups. It's also one of the courses that fulfills the Citizenship and Public Ethics theme requirement, and usually teachers require students to do group projects on local issues, which I'm very excited about, as this will let me try out a modified version of that city writing/finds research process that Jenny and Jeff talk about. I have lots of ideas already, and a while back I used the new-for-OSX-Tiger built-in news aggregator in Safari to set up a folder of feeds from all the local publications I could think of, so that's helped a lot. At Jonathan's insistence, I watched the original Star Wars trilogy for the first time. People are shocked that I'm such a science fiction geek but I've never seen those movies. I'm already seeing Star Wars' influence on other movies and series. For example, Data on Star Trek: TNG reminds me a lot of C3PO (telling the captain the odds that some act of derring-do won't work, social ineptitude, etc.) and Moya's pilot on Farscape even reminds me a little of C3PO as well. I must see episodes 1, 2, and 3 now. I finally created a Flickr account, and I'm wondering why I didn't do it months ago. 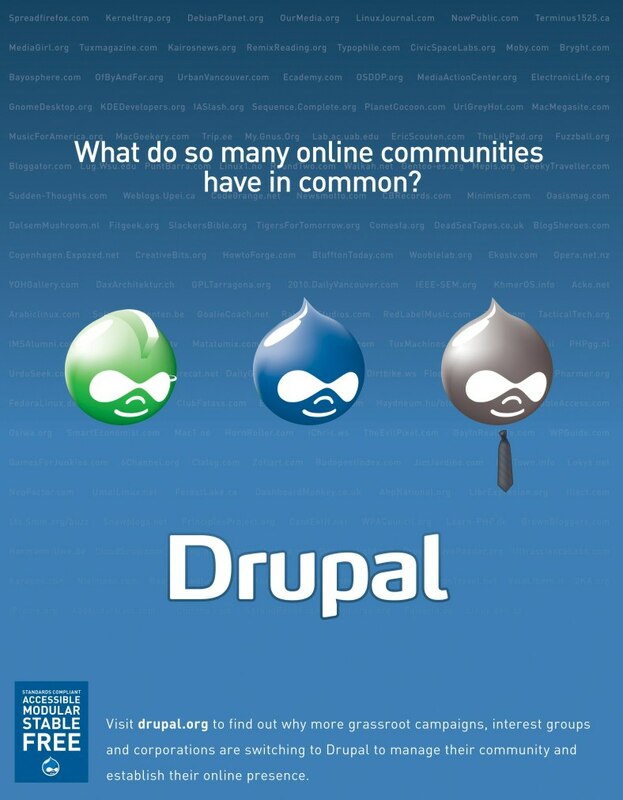 Check out this cool Drupal ad for the Free Software Magazine! For anyone who was scratching his or her head about the relevance and import of the work that's being done on silence (see also Cheryl Glenn's Unspoken), this op-ed piece should clear it up for you. Am I, like, the only person alive who had never heard of The Red Hat Society until the other day? All the stores around here have Red Hat lady merchandise -- red hats, of course, purple clothing, ceramic figurines of red hats, purple socks with little red hats embroidered on them, etc. Cookie jars, even. I saw the cover of one of the books from far away and thought, hey, that looks like an interesting Linux user/developer group! Seriously though, I told the manager of my local yarn store that they should offer special knitting classes for Red Hat Society women and classes for friends and family of Red Hat women in which they could knit red hats and other red and purple stuff as gifts for them. She thought it was a great idea. I hope they do it; I want to do anything I can to support locally-owned businesses. I'm trying to get back into the flow of work and shake this out-of-sorts feeling I'm experiencing. Last night I got back from a far-too-short trip, a place and a person it always twists and bends my heart to leave. My prospectus defense is Wednesday afternoon, 1:00-3:00, and I'm anxious about that. I have writing deadlines looming and grading to do this weekend. But enough about all that. The most important thing in this post is this link to a recent presentation by Samantha Blackmon, David Blakesley, and Charlie Lowe titled "Teaching Writing, Collaboration, and Engagement in Global Contexts: The Drupal Alternative to Proprietary Courseware." You should all read their slides immediately; they've really done a great roundup of problems with hegemonic course management software like WebCT and Blackboard, and they've done an even better job spelling out most of Drupal's features. When I try to talk to people about Drupal, I find myself not even knowing where to start. I guess what I need to do is rank my two or three favorite things about it, or, rather, two or three salient differences between Drupal and the major course management applications. I got a brief mention in my college's newsletter (I'm under "People."). Are Sam and I the only ones who will be knitting at CCCC? It makes no difference to me whether those in attendance knit or not; I just want to have a lively group there. Email Sam or me if you'd like to find out the time and place. I hate it when people confuse the words "reign" and "rein." I wish Brendan would devote one of his Writing Pedantry posts to this problem. Sunday afternoon, on the way to the airport, my mom and I stopped by my grandmother's house for a lunch of soup and cornbread. For a long time now, I've been wanting to do that once-a-month cooking thing; I hear those who do it save a lot of money. Certainly my grandmother has done it as long as I can remember; in fact, in that picture I linked, she and I are standing in front of the deep freeze, which is packed with soups, vegetables grown by members of my family, pies, and other goodies. So I was at the grocery store this evening, and, inspired by both my grandmother and Lauren, I was seized by the urge to make a big pot of soup. I reviewed what I already had at home that would be good in soup -- brown rice, beans, chicken broth, and just-thawed chicken -- and I bought two cans of roasted garlic diced tomatoes. I baked the chicken (three breasts) in olive oil and a BIG pinch of Herbes de Provence, threw the rice, beans, chicken broth, and tomatoes in a pot, diced the chicken in the CorningWare dish so that it would sop up the remaining olive oil and Herbes de Provence, then put it in the soup. I added some red pepper flakes, but no other herbs or spices. It's fantastic, and there are now four jars of it in my freezer.